21704 87 th Ave S.E. Absolute Mobility Center, Woodinville is your place to buy a new or used handicap van in northwestern Washington state. Located in beautiful King County, we serve the greater Seattle metropolitan area. We offer an extensive selection of wheelchair vans, both new and used. Whatever your accessibility and adaptive driving needs, we can get you the perfect vehicle. In addition to sales, we offer handicap van rentals. So be sure to come see us if you're visiting our area, if your own vehicle is temporarily out of commission for servicing or if you need to rent for any other reason. At Absolute Mobility Center, Woodinville, we also supply electric scooters and wheelchairs. We offer one of the leading selections available in the Pacific Northwest. We also sell and install adaptive equipment for vehicle conversions. For example, see us for restraint equipment, ramps and lifts, adaptive driving hand controls, electronic driving equipment, transfer seating systems and more. Get peace of mind by acquiring through Absolute Mobility Center in Woodinville. 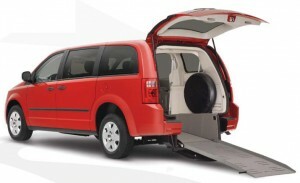 We have Washington state's largest service center for handicap vans. Our highly trained, experienced mechanics are well-equipped to provide unbeatable vehicle and equipment service at low prices. Our knowledgeable and caring staff makes every part of the process of buying, renting, or getting service a pleasure. We're dedicated to the highest level of customer service and conduct ourselves in an honest and ethical manner at all times. All of our products are of the highest quality, are reliable, and meet or exceed relevant safety standards. If you have need of a wheelchair van, adaptive driving or accessibility modifications, a power wheelchair or scooter or vehicle or equipment service, we hope you'll come see us. About Absolut Mobility Center in Woodinville Absolute Mobility Center has two award winning locations and a Better Business Bureau A+ Rating to better serve you. Our Woodinville location is just Northeast of Seattle, is your customer wheelchair accessible van dealer throughout Seattle, Everett, Bellevue and Woodinville.